If my candidates are any indication, talking about salary is one of the most dreaded conversations one can have — second only to perhaps “the birds and the bees” discussion with your child. Fear not, my friends, I’ve put together some advice to make the process painless. Be Prepared – If you’re applying for a job, you’re going to get asked about salary somewhere along the way. Don’t be surprised when the question gets tossed your way; and for the love of money, be ready to answer! Don’t Give the Heisman – Sometimes candidates try to hedge when asked direct questions about salary. Bad idea. Hiring managers are going to keep asking until they get the information they need, and the hedging immediately raises suspicions. Tell the Truth – You may be asked specifically what your most recent salary was, and sometimes you may even be asked about your salary history. Be honest. Some organizations will call to confirm prior employment and ask about salary. If a candidate is caught in a lie, it’s all over but the shouting. Have Your Numbers Ready – The most critical piece of information you’ll need is your desired salary. I usually suggest candidates have a range instead of just one number so that you have built-in flexibility. A range should probably span 5-10k for mid-level employees and 10-20k+ for senior staff with higher salaries. Do Your Homework – Some of you probably read #4 above and thought, “But how do I know what my range should be?” It’s not as complicated as some think; but you will need to take into account a menagerie of factors, including your most recent salary/salary history, your experience, the role at hand, geography, education, and market conditions. Speaking of…. Know Thy Market – Consider current economic trends, cost of living, demand for your skill set, etc. Stop Talking – The best bit of salary advice I’ve gotten came from a fellow who told me, “After you answer the salary question, stop talking.” He said too many people can’t stand the deafening silence that occurs after the number has been uttered; therefore, they keep talking…and talk themselves right down to a lower salary. 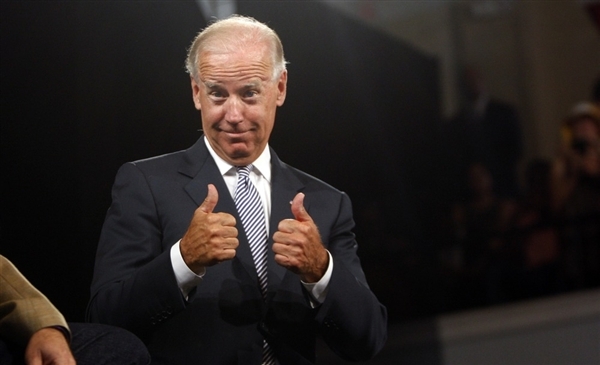 Let’s all learn something from Joe Biden here and know when to stop talking.